Today we begin a series on rest periods and leave during the First World War. ‘The Originals, we who had enlisted when the Battalion had first been organized, had the numbers 434 as the first three digits of our serial dog-tag numbers. We were jealously proud of having the lowest numbers in the Battalion and resented privileges being accorded to men who enlisted much later while members of the original contingent were passed over… Time after time I had been “due” for a leave to Blighty, but each time it was my turn, someone had been given priority. I pencilled [sic] : “I was again up for a Blighty leave, but some ‘435er’ got ahead of me…” ‘ (Wheeler, The 50th Battalion In No Man’s Land, p. 132). 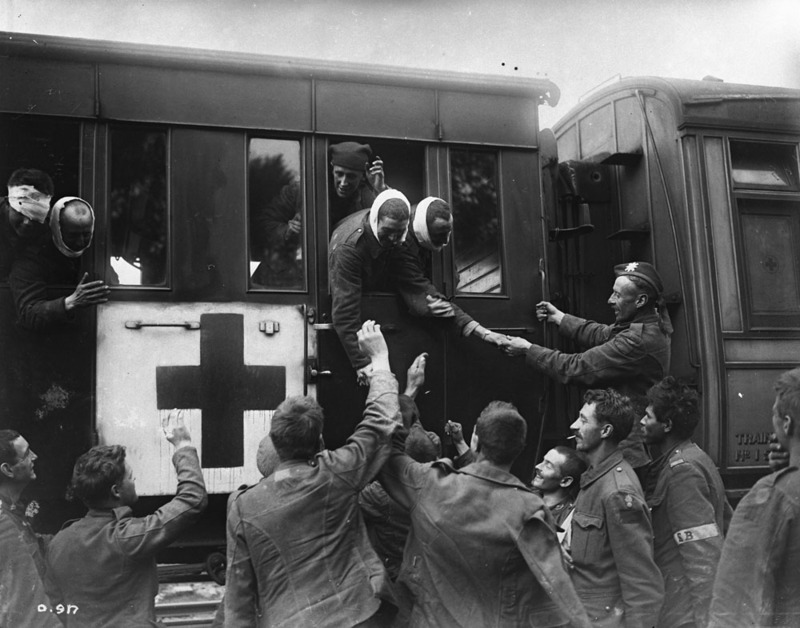 Wounded troops leaving for Blighty are sent-off by their healthier comrades. Those who received a “Blighty” wound were generally envied by those they left behind in the trenches. Credit: Canada. Dept. of National Defence/Library and Archives Canada/PA-000975.